Optimization is an important field in its own right, but it also plays a central role in numerous applied sciences, including operations research, management science, economics, finance, and engineering. 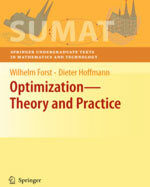 This textbook offers a modern and well-balanced presentation of various optimization techniques and their applications. The book's clear structure, sound theoretical basics, insightful illustrations and instructive examples make it an ideal introductory textbook, providing a comprehensive foundation in one of the most fascinating branches of mathematics. Notable features include detailed explanations of theoretical results accompanied by supporting algorithms and exercises, which are often supplemented by helpful hints using Maple. Written at an introductory level, this book is intended for advanced undergraduate and graduate students, but may also be used as a reference by academics and professionals in mathematics and the applied sciences. Maple worksheets may also be downloaded from Professor Forst's website: http://www.mathematik.uni-ulm.de/numerik/staff/forst/.